We're not sure how Santa fit his fat little self down this chimney throughout the years but he was decidedly happy that we left it up until the 26th so he could make one final delivery: a rotor-hammer that came with a free 4.5 inch angle grinder. We didn’t need to use either of these fancy new tools to deconstruct the chimney however, because it was held together by habit, not by mortar. The first 5 feet came down in 15 minutes and the last 25 feet were out of the house, cleaned and stacked in a tidy row in under 3 hours. Thanks to our work crew, Jill, Heidi, Aaron and Scott, many hands made light work (it was still heavy work but it went super fast!). Now I have all the makings for a new brick patio but we’re a long way off from a project like that. We wrapped up the day by tearing out the drywall from one room in the basement—mostly Justin did this since I was pooped (that’s why this post is a day late). We have one more room to go in our deconstruction in the basement plus a good clean-up of the whole house before our demolition is final finished. Well, maybe there are a few other odds and ends but for the most part, that’s it. Here's Jill chipping off the "mortar". Scott posing in a very dusty room after the first floor of chimney was deconstructed. Here's the work gang posing in front of a very organized stack of bricks. Here's Justin tearing into the drywall in the basement. Another dusty shot. The snow has melted enough now that we were able get up on the roof today. Today's project was tearing down the chimney below the roofline and patching the roof. This is our last big demo project to complete before we can start construction. Justin scrambled up there and had the chimney knocked down below the roofline in about 15 minutes. That was the easy part because the mortar was so loose that it really wasn't doing anything. Too bad though because earlier we had stopped by the Home Depot for a fancy new tool, a roto-hammer, for busting up the mortar. After we had the big hole in our roof, we went back to the Depot for roof patching materials. Of course, they didn't have the shingles we needed and couldn't get them anytime soon. Here's Justin up on the roof with the chimney liner pulled out. Yeah! Waste Management finally came to pick up our dumpster. We got to meet our neighbor Brett who lives in the house just behind this truck. He helped up shovel the alley a little to get the WM truck into our driveway. A shot of our hole before the patch. Here's Justin cutting up some new framing for the rafters to fill in our hole in the roof. It is so nice to snuggle up with warm bodies and a blanket and warm cup of tea. It's even nicer to do this after spending the day in a house with no heat. We were up at the house at 9 am to meet the parade of subcontractors lined up to bid on our job. Today was a big success. Nearly everyone on our bidding list showed up and walked through and promised to send their bids in next week or sooner. While Justin talked and walked with the subcontractors, I spent the better part of the morning pulling out the bottom piece of lath from the studs. This last piece is shoved down below the flooring so it requires a lot of prying and wiggling to get out. I was nearly finished when Justin asked me to go run copies of our work scope and pick up lunch. Seattle is still snowed under and the neighborhood streets are now all rutted out and very difficult to drive on. I didn't feel too great about driving up the street to run this errand so I walked. It was only a few blocks, but it was raining and the sidewalks are in sorry shape. I stopped by Delite Bakery for lunch which was the highlight of this cold and miserable day. The staff helped me pick out some delicious pastries for lunch (hombow, ham&cheese croissant, & empanda) and welcomed me to the neighborhood. I'll definitely be going back because their food is great and very inexpensive. In the afternoon, Justin and I were both shivering in our boots and Justin got this great idea to build a fire in the fireplace. We have no shortage of kindling and dry, clean wood and we had a rip-roaring fire in no time. I figured if I pulled the nails from the trim pieces, I could sit in the living room in front of the fire and stay warm. The fire didn't heat up much of the rest of the house though. Justin got into the demo action a little in the afternoon as the stream of subcontractors slowed and pulled out a lot of the electrical wiring in the basement between the floor joists. We're still waiting for it to warm up enough to melt the snow and ice on the roof and let us get up there to deconstruct the chimney. We want to be done with that by the 6th of January so our framing work can start. Tomorrow we'll have another big work day and hopefully even get onto the part where we vacuum up some of the dust. The dumpster is still full and the message is that *maybe* it will be picked up on Saturday but we aren't holding our breath. Well, the exclamation point isn't really suitable for what happened today: 2 bidders. It seems that the weather is going to stymie progress. Many of them rescheduled for next week and we might have a couple coming tomorrow. This doesn't sound too bad unless you take a look at the Seattle forecast which is calling for more snow, high winds and cold temperatures for at least the next 4 days. So, I'm not thinking conditions are going to be much better anytime soon. We had planned to take the chimney down this weekend and have the roof patched but that's looking unlikely since the roof is pretty slippery and snow covered. Plus, the worst of it is that our dumpster pickup was rescheduled for Monday so we have a full dumpster going into the weekend! Uggh! I guess this is the part where renovation gets frustrating. Demolition is still the number 1 chore and tonight we moved into the basement. This whole event was a bit tricky since it snowed about 8 inches in Seattle and the streets were in bad shape. Justin put chains on his car and we made our way, albeit slowly, over to Beacon Hill for our chance to fill up the dumpster (again!). Tomorrow is a big day for our project: bid day. Weather permitting, we'll have about a dozen contractors from various trades coming to walk through our house and give us an estimate of what it will take to do our projects. Justin is taking the day off of work to lead them through. We xeroxed a bunch of copies of our drawings and marked up the drawings to annotate our electrical outlet desires for the contractors to use in preparing their estimates. Justin has been diligently developing scopes of work for the bidders so we should be in good shape to get comprehensive quotes. So the progress for tonight: we tore off the drywall (yeah! it's not plaster in the basement) in the front room and found a few surprises. First off, the person that "finished" the room used masking tape to finish the seams on the drywall. Second, we found a secret room. This is our first big find in the house if you don't count the dirty boy's underwear that was stashed in the attic. Here are some shots of the secret room, under the porch. Yes, that's more underwear you see. There are at least 2 women's slips down there, a bunch of scrap wood, some old, old boxes, a large basket, and a bunch of other things that I'll term as garbage. And here's a less exciting photo of demolition in the back room. Amazingly, we found some insulation. This is it for the whole house and whomever installed it didn't do a first rate job. We found a 24" stud cavity with a 20" batt. And, in other good news, we got our STFI Construction Permit on Wednesday. So, after we finish our demo, we're free to start construction! We made a ton of progress this weekend and are finally on the home stretch of demolition. Michelle & Ryan joined in the fun and helped us out on Saturday. Thanks R&M! 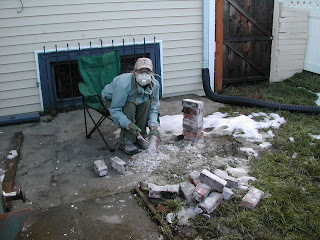 We spent the whole day smashing plaster and hauling lath and plaster out to the dumpster. Michelle and I were the primary haulers while Ryan and Justin got busy with the sledgehammers. We finished clearing the ceilings upstairs as well as the entire stairwell. By the end of Saturday we had the whole upstairs stripped down to the studs and all of the debris picked up and put in the dumpster. It was filthy, strenuous work! Michelle and I had filth all over our faces at the end of the day. When I got in the shower that evening, the water ran gray through 2 shampoos. Over night, our first snowfall of the season came and we woke up to about 2-3 inches of snow, an infrequent occurence in Seattle. It made driving from our house in West Seattle to Beacon Hill a little dicey due to the fact that Seattle doesn't own plows or salt the roads. But, we made it over the two big hills and back again safely. Justin and I spent most of Sunday doing little details that wouldn't generate a lot of waste. I clipped all of the K&T wiring out of the first and second floors and unscrewed all of the recepticles in the living and dining rooms while Justin sawed off and capped the plumbing. We still have a functioning toilet which is mostly all I care about plumbing-wise. Ultimately, we wrapped up those tasks and took to removing the 700 billion nails from the studs. Each piece of lath is tacked onto the studs with two nails on either end and often two nails at each stud it crosses. When you pull off the lath, you usually pull a few nails with it but generally, you leave a bunch of nails behind. So, we spent about 2 hours pulling nails and still have about 250 billion nails left to go. Here's Justin freezing his tush off extracting nails from the studs. Justin and Jill took the day off to carry the demolition a little further. The dumpster was emptied on Tuesday and it's full again today. We'll have it emptied on Friday so we will be set for the weekend. It's a little sad generating this much waste with our project. Hopefully the recycler will find something useful to do with lath and plaster bits. Justin put his thinking cap on and built a chute out of ductwork from the house. He propped it up with our extension ladder. It was a modern day chutes & ladders in our back yard! They wrapped up the day having cleared all of the piles of plaster and lath from the house and pulling out half of the ceiling in the master bedroom and the walls of the bathroom upstairs. After an initial hack-fest on the fir trim throughout the house, Justin decided to put his kid gloves on and remove the remainder with the plan to reuse. He's salvaged much of what was left upstairs. Hopefully we can figure out how to clean this stuff up and reuse it. With a full dumpster, we couldn't get too carried away with ripping out more plaster but we did our best. Jill and Scott were back for round 2. They came to help after a full day on Saturday and their morning run of 6-10 miles. They're tough! This is a photo from the future master bedroom looking into the future closet & bathroom. Justin capped off most of the plumbing so we can start ripping out fixtures and pipes and we cleaned out a problem gutter. The gutter was backed up and leaky and after disassembling it, we found a good 10 inches of muck and some plastic pieces plugging the passage. I also got rid of a bird's nest on the porch. It didn't appear to be occupied so I don't think any bird is going to miss it. Plus, I'm doing those birds a favor because my cats are fond of eating birds. Today was a big day for our project. We had 6 of our best friends come over and work up a good sweat. Thanks Amy, Brian, Jill, Scott, Heidi & Aaron! We suited up to protect ourselves from lead paint which we assume is all over the house. Here's a group photo before we got too crazy with the sledgehammer. We had to pull all of the carpet out of the house and pry up the tack strips. Here's Jill finishing up the job. The kitchen was our first victim to the sledgehammer. We had so much debris that we filled the 7 yard dumpster and had a bunch of the lath left over so we built a bonfire (not really) in the kitchen. We'll get rid of this pile when Waste Management frees us of the first load--thanks Ben @ WM for hooking us up. Aaron found a really cool bee's nest in a wall. Thankfully it had been long abandoned. This is going to be a treat to clean up! Here's a view of the kitchen with most of the demo complete. We'll be opening up this wall a bit to make room for a peninsula from kitchen to the dining room but we're going to need some guidance from our architect on how to frame it out properly. So, we finished up the day around 4pm, just as the sun was setting which was convenient since we were pooped. We accomplished a lot! The kitchen is stripped of its plaster and 2 of the 3 bedrooms upstairs have been gutted, except for the ceilings. We'll need an empty dumpster before we can get too much further and maybe some time to recoup our tired muscles. Justin and I bought a house together. It needs some work. The house hasn't been renovated (ever) and it was built in 1920. We bargained the seller down to a price we could live with but it still seems like a lot looking at the work we have ahead of us. We'll need new: plumbing, electrical, HVAC & ductwork, kitchen cabinets/counters/fixtures/appliances, bathroom cabinets/counters/fixures, flooring and some windows. Whew. We hired an architect to help us change the floor plan a little and she's nearly done with the final drawings. 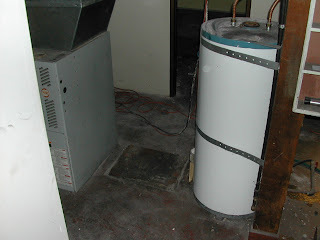 We've gone through the preliminaries, prior to closing on the house, so we could hit the ground running when we closed. Our first project has been to disconnect the sketchy wiring at the panel and install some temporary circuits to use during our demolition. Here are some photos of our makeshift lighting and new (temporary) electrical service.